Duke Energy is trying to triple the mandatory fee that South Carolinian’s Duke customers pay before they use the first kilowatt of electricity. Duke Energy filed significant rate increase requests with the Public Service Commission that will: a) hit particularly hard on poorer South Carolinians, older South Carolinians, and renters and b) discourage investments in energy efficiency and alternative energies. Duke Energy Carolinas (DEC) and Duke Energy Progress (DEP) are seeking to raise electric rates for their typical residential customer (1,000 kWh per month) by 14 percent. A large component of that is increasing the “basic facilities charge” from $8.35 (DEC) and $9.05 (DEP) monthly to $28.89 (DEC) and $29.00 (DEP). As the chart to the right shows, for DEC’s RS Rate Schedule (residential service that is not all-electric), the percent increase in monthly costs declines rapidly as use grows. T he typical DEC RS electric customer faces a 13.68 % increase monthly compared to a very high use residential customer whose bill would actually go down. The pattern is the same for DEC’s RE all-electric rate and for DEP, although the highest DEP users still face an increase, but only 3.1 %. To hear the utilities tell the story, poor people are the high users because they live in energy-inefficient homes, with poor insulation, old heating and cooling equipment and use inefficient home appliances. Oh, they’re also bad consumers according to the utilities. Some low-income consumers who live in old mobile homes with ancient electric strip heating may pay more. We need to expand public and utility programs to address energy efficiency in our poor housing stock. Surveys conducted by the Energy Information Administration tell a very different story than the utilities—electric consumption is highly correlated to income. This graph shows us that in the South Atlantic Census Division those with 2015 household incomes up to $20,000 used only 10,219 kWh in the previous year, or 908 kWh per month. That compares to nearly twice the consumption (19,971 kWh annually and 1,660 kWh monthly) for those making over $140,000. Undisputed research tells us that low-income customer s suffer from high energy burdens. That’s because their energy costs are high for their income—not because low-income consumers are high electricity users. The chart at the right shows the weighted distribution of electricity use within income groups. The highest consumers among low-income customers are lower than for all other income groups. Low-income people simply reduce electric consumption … even if it means living in the cold (or hot) and dark. We see similar patterns if we look at renters versus owners: 858 kWh per month for renters compared to 1,257 kWh per month for owners. Consumers 65 and above used 1,062 kWh per month compared to 1,141 kWh on average for those under 65. The effect of front-loading costs is that the per kWh cost declines as consumption increases. A typical DEC RS rate customer, who uses more than the average lowest-income customer, pays 12.9 cents per kWh. The highest users, who are better off, pay only 11.1 cents per kWh. And it means that our most vulnerable are paying significantly more per kWh than better off Duke consumers. This is unjust, but it is more than unjust. Because you pay less per kWh as your consumption increases, you’re less inclined to invest in energy efficiencies like better insulation or more efficient household equipment, including heating and air. You also have less incentive to invest in alternative energy sources. While public policy should drive us to energy conservation, a front-loaded rate design sends us in the other direction. For low-income customers, this is especially burdensome. By taking nearly $30 every month out of an already tight budget before any electricity is used, you take funds that otherwise could be used to improve energy efficiency in your home. Not only do you have a lower incentive to invest if each addition kWh costs less, a high basic facilities charges means you no longer have the money to invest in saving energy costs. You have lost control of your ability to save on electric costs. A number of organizations will oppose these high mandatory fees. Consumer advocates will push for public hearings in the DEC and DEP service territories when hearings begin. The PSC must hear from consumers that they should reject these substantial increases to the basic facilities charge in order to protect lower income, older and renter customers and to encourage energy conservation efforts. The high mandatory fees are both unjust and bad energy policy. U.S. Energy Information, Administration, Residential Energy Consumption Survey (RECS) 2015 Survey Data (December 2018) at https://www.eia.gov/consumption/residential/data/2015/index.php?view=microdata. All analyses presented here are for the South Atlantic Census Division because the sample size does not support state level estimates. This is the most reliable data available on residential electric consumption. As the S.C. General Assembly looks to do “tax reform,” a new report, Who Pays? A Distributional Analysis of the Tax Systems in All 50 States by the D.C.-based Institute on Taxation and Economic Policy [ITEP] illuminates the flawed premise which underlies the effort to make our taxes “lower, flatter and fairer”. Focused especially on lowering income tax rates for upper income taxpayers, those efforts would push income tax burden further down the income scale. Looking at state and local taxes as a whole, the distribution of taxes paid by SC families is already, compared to most other states, relatively flat across income groups, except that our highest income families contribute a lower percent than most South Carolinians. Shifting income tax shares from upper income families onto lower-income families makes our tax system less flat and less fair … not more. Who Pays? shows that our lowest income families, those below $19,400 annual income in 2015, pay 8.3 % of their income to state and local taxes under laws in effect on September 10, 2018. For the top 1 % of family incomes, above $416,000, only 6.8 % of that income goes to state and local taxes. Our state and local taxes are regressive when our lower-income families are contributing more as a share of income than our wealthiest families. Driving differing shares at different income levels, the below table shows, is that the bulk of tax revenues come from progressive taxes on income and regressive sales and excise taxes. When you combine them with the moderately regressive property tax, you produce a combined tax burden that is higher on poor people (and the middle class) than on our wealthiest families. Make our Earned Income Tax Credit refundable so that those who don’t owe income taxes can access it. Tax ordinary income and capital gains at the same rate, instead of ignoring 44 % of capital gains income. Tax pass through income at the same rate as other personal income. Make any tax credits that offset sales, excise or property taxes refundable so that lower-income households can access those credits. Reimpose the tax on large estates and inheritances. At the same time, when the General Assembly looks at sales taxes, the way to lower sales tax rates is to expand sales taxes on services and not onto the higher-dollar exemptions on items like groceries, drugs, and household electricity and water that make our overall tax system less regressive. And, as nearly every member of the General Assembly knows, they should repeal Act 388 that eliminated property taxes for school operations on owner-occupied homes. They paid for it, largely, by increasing the regressive general sales tax and shifted property tax burdens onto businesses and renters. That would take more courage than anyone believes they have. As the General Assembly moves to “tax reform” discussions in 2019, there should be a full recognition that there are no “noncontributors”. All South Carolina families pay taxes and families in the lowest 20 percent of incomes pay 22 % more in state and local taxes as a share of income than those in the top 1 percent. If they only look at income taxes, they will not see the whole picture. South Carolina adopted H. 5341 on October 3, 2018 to update our conformity and nonconformity with federal tax law. Analyses of that legislation suggests that the final bill has a slightly progressive effect, though not enough to change the general shape of the distribution in South Carolina as described in Who Pays? At the July 1 public telling, Mayor Steven Benjamin presented a slideshow comparing these returns favorably to Boeing expansion in North Charleston on a bang for the buck basis. Such a comparison is simply wrong-headed and underlines the fundamental flaw in the use of this kind of economic impact analysis. The Boeing project and its investment and employment impacts is essentially all new. No other plane maker in South Carolina is losing business because we invested in Boeing. Nobody in South Carolina who was going to buy another kind of plane won’t because they decided to buy a Dreamliner from Boeing. Such incentives to recruit manufacturers who will export practically all of their output without competing with existing South Carolina businesses can be a good deal for South Carolina. But that kind of analysis, if applied to Columbia and its environs, does not apply to the Bull Street Project. The bulk of the economic activity is the result of construction of homes, apartments, offices and parking garages in that chunk of Columbia. Unless you assume that the Bull Street project will cause people to move to the Midlands, everyone buying or renting a home in the development would have bought or rented a home somewhere in the Midlands. This may be economic activity, but it’s not necessarily new economic activity. Likewise, the new offices in the Bull Street Neighborhood would have been built (or remained occupied) somewhere else in the Midlands, much as the people employed there would have been employed somewhere else. It would take a pretty complex analysis to determine the net regional benefit or loss of creating in this particular place and time a large inventory of new homes, apartments and office buildings. We suspect that the net economic activity is fairly small at best. You’re just moving around economic activity that would take place in any case. Likewise, the study looks at Estimated Annual Property Tax Revenues at page 15, assuming a $60 million increase in assessed value. That includes an increase to the county of $2.2 million annually. But that assumes that none of these buildings would have been built in Richland County and that the housing and office stock buildup does not undermine the value of existing buildings, thus lowering county taxes. The same applies to school taxes. Clearly, replacing a large chunk of untaxed land within the City with taxed properties helps the City’s coffers, as long as providing services to the neighborhood costs less than the $4.3 million estimated increase of revenues. That $4.3 million number also assumes that none of the development that would have taken place within City limits absent the Bull Street Neighborhood Development. Miley and Associates used appropriate data and methodologies in their study. They used the respected IMPLAN model to develop their estimates. We don’t quibble with their numbers. But public officials who read these studies have to understand what they are … and what they are not. Perhaps the Greater Columbia Chamber of Commerce should be embarrassed for not asking their economic consultants to look at the net impact of this development. Saying you brought a billion dollars in economic activity to your community is a great campaign speech. But City planners and elected officials have an obligation to ask about the net benefit when looking at a project like this. They may well conclude that it’s worth doing. But they should not be doing it based on only half the story. They should always insist on careful assessment of the net benefit—how the economy of the City and its environs will be better if they do the project or make the investment as opposed to not doing the project. Secondly, they should look at the opportunity cost of the investment. Can something else be done with the dollars, including leaving them with taxpayers to spend, that would provide a better return to taxpayers and the community? Does making this investment block you from more productive investments down the road? The public trust demands no less. First, let’s be clear. If a minor league club moves to Columbia, I will have season tickets just like I did when the Bombers played in Columbia. I was, for several years until last year, the Co-Chair of the Business of Baseball Committee of SABR, the baseball research society. It’s not about who loves baseball. It’s about good fiscal and public policy. Minor league baseball does not attract people from outside the immediate area to attend games. If a Columbia team put 400,000 fannies in the seats for all events each year as projected by the agreement, nearly all of those folks would be from Columbia and environs. [Even if minor league teams attracted tourists, we have our doubts about trying to promote tourism for an outdoor summer sport played in “Famously Hot” Columbia.] So it’s not bringing in new revenues—a core test of an economic development investment. Baseball revenues come from discretionary spending. Absent a baseball game, those dollars get spent in existing restaurants, stores and movie theaters. So investing in a ballpark undermines existing businesses without adding to overall well-being. Minor league clubs do not create many jobs and those they do create are generally low-paying and part-time. Visiting ball clubs, umpires and major-league affiliate employees simply don’t generate enough nights at cheap motels or meals at fast food places to drive an economy. Nobody is going to start a bat or baseball factory to support the ball club. A minor league ballpark is essentially an outdoor restaurant with entertainment, not the catalyst for new restaurants around it. Unless cities drive much better deals than they usually do, the costs will outweigh the revenues. Do we need to discuss Columbia’s history here? In any municipal economy, a sports team comprises a vanishingly small part of the economy—far too small to drive growth. The impact on personal income is insignificant. Even if you could show some benefit from a ballpark, the commissioned studies to justify the expenditures almost never look at the opportunity costs of that investment. If we don’t plunk $20 million down for a ballpark, could we better invest those dollars for a more meaningful return (on infrastructure, education or workforce development to name just three possibilities) or get a better return by leaving Columbia taxpayers with more money to spend in existing businesses? Does it ever make sense for a city to fund a ballpark? Some researchers who look at the question conclude that if the ballpark is a part of an urban revitalization or a “festival center” with many destination facilities located in a cluster then it makes sense. Classic examples are Baltimore’s Camden Yards and the collection of sports venues in Indianapolis or Columbus, Ohio. Here, the “festival center” rationale does not apply. The development of the Bull Street Neighborhood is apparently going to occur. What is unclear is what impact a ballpark will have on the success or failure of that development. If it will have a significant positive impact on the development, why doesn’t Hughes Development Corporation pony up the funds? Or the owner of the new team? If it made economic sense they would … unless another sucker is willing to do it for them. In the end, the rationale for public funding of a ballpark—and there is nothing politicians love more than throwing public money at rich people—will be pretty squishy. They will relate to things like standing. “Without a bush league ball club, Columbia will look like a bush league city.” Or culture—how important baseball is to the soul of America. Or how much the Mayor and other powerful people love the game. There is little research on any of those, which makes them quite handy for selling a ballpark which can’t honestly be sold on financial or economic development grounds. I hope we get a stadium and a ball team. But the taxpayers who don’t enjoy or benefit from them shouldn’t have to put up the money to subsidize my hobby. Some 700,000 South Carolina non-elderly adults aged 19 to 64 lived at or below 138 % of the Federal Poverty Level (FPL) in 2011. The Affordable Care Act expands eligibility for Medicaid to those with incomes below 138 % FPL. Children at these income levels are already covered under our Medicaid and seniors 65 and above are nearly all covered by Medicare. Of those 700,000 nearly half (46 percent) reported themselves as uninsured in 2011. A large proportion (two-thirds) of South Carolina’s uninsured non-elderly adult population (ages 19-64) at or below 138 % of the Federal Poverty Level was either employed or unemployed but seeking work. Among them two-thirds were employed (40 percent) or unemployed but in the labor force (27 percent). One-third was not in the labor force. South Carolina is generally a low-wage state, ranking 44th among the 50 states and the District of Columbia for annual median wage. (ftp://ftp.bls.gov/pub/special.requests/oes/oesm12st.zip.) Two-thirds of South Carolina workers are in occupations where half the employees make a wage which would qualify a full-time (40 hours per week) worker with a family of four for the Medicaid Expansion under the Affordable Care Act. Source: US Dept. of Labor, Bureau of Labor Statistics, Occupational Employment Statistics: South Carolina (May 2012). 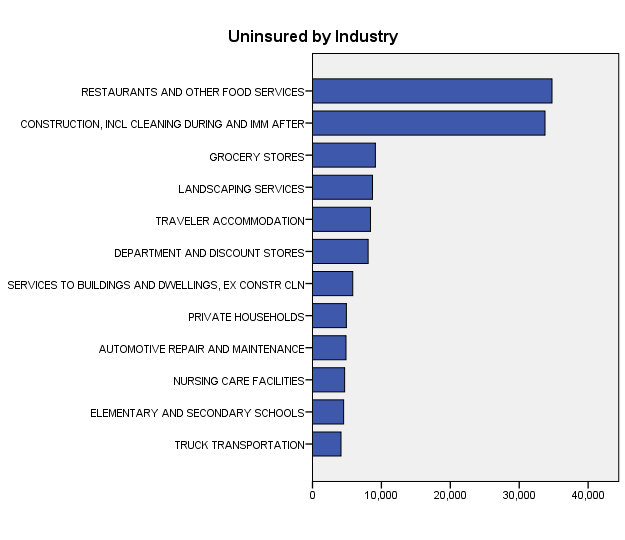 The two largest industries with uninsured employees who would be Medicaid eligible are Restaurants and Other Food Services and Construction. For the most part, the industries in which the uninsured working poor toil are the industries that take care of us, our parents and our children. If instead of looking at industries (who you work for) we look at disaggregated occupations (what you do), we see this even more clearly. 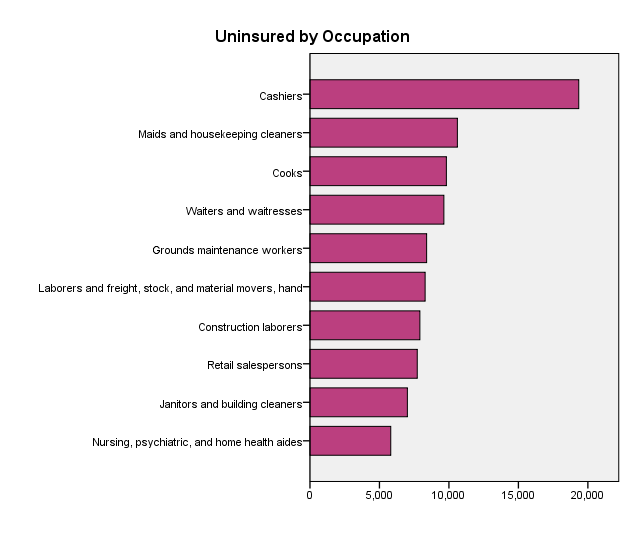 The most populous uninsured occupations are cashiers, maids and housekeepers, cooks and waiters and waitresses. Wholly aside from the compelling justice and economic arguments for a Medicaid Expansion, the people who interact with our lives most intimately— handling our food, our cash and cleaning our homes and hotel rooms—are most likely not to have health coverage and reasonable access to health care. Think about that the next time you go to a grocery store or restaurant. That’s a public health concern. SCDHHS Director Tony Keck suggests that major portions of the uninsured will be covered under the Health Insurance Marketplace (what we used to call the Exchange). If South Carolina fails to expand Medicaid, businesses with more than 50 employees could face $30-$46 million in potential shared responsibility liabilities according to Jackson-Hewitt Tax Service as employees making between 100 percent and 138 percent of the Federal Poverty Level, but not covered by their employer, enroll through the new Healthcare Marketplace. If South Carolina expanded Medicaid, those employees would be Medicaid eligible and their employers would not be subject to the shared responsibility tax liability of $2,000 to $3,000 per employee who enrolls through the Marketplace. That still leaves 80,000 working poor South Carolinians uncovered. Many uninsured working poor are employed in small businesses. Although those small businesses won’t face penalties for failing to cover employees, the ability to cover lower wage workers through Medicaid relieves financial pressures on the businesses, making it easier for them to provide coverage to their other employees. The Medicaid Expansion makes sense for South Carolina workers and South Carolina employers. Unless noted otherwise, data is taken from the American Community Survey’s Public Use Microdata Survey (PUMS) 2011 data. That is survey data which must be used with care, especially as you try to break out different categories. We could trend this data to 2014, but that simply adds speculation to imprecision. Here we will focus on the uninsured, although it is important to recognize that telling the Census Bureau that you have health insurance is not the same as having good health coverage, whether because you bought a lousy policy or your policy has such large co-pays and deductibles that you can never afford actually to use it. There is overlap, but 37 percent reported having insurance through and employer or union and 12 percent having purchased coverage directly. The largest proportions of insured adults under 138 % had coverage from Medicaid (47 percent) or Medicare (17 percent).